Patients with a rare medical condition can receive life-saving treatment at the touch of a button thanks to a new device developed by scientists. Researchers at Newcastle University, UK, have devised a way for patients and healthcare professionals to access web-based emergency clinical management information for Addison's disease. The chronic disorder means the body fails to produce the stress hormone, cortisol. It can be life-threatening if a patient suffers adrenal crisis and is not urgently given an injection of hydrocortisone. If the patient develops an illness, undergoes surgery, or stops taking their medication, they can develop adrenal crisis due to insufficient levels of the stress hormone. 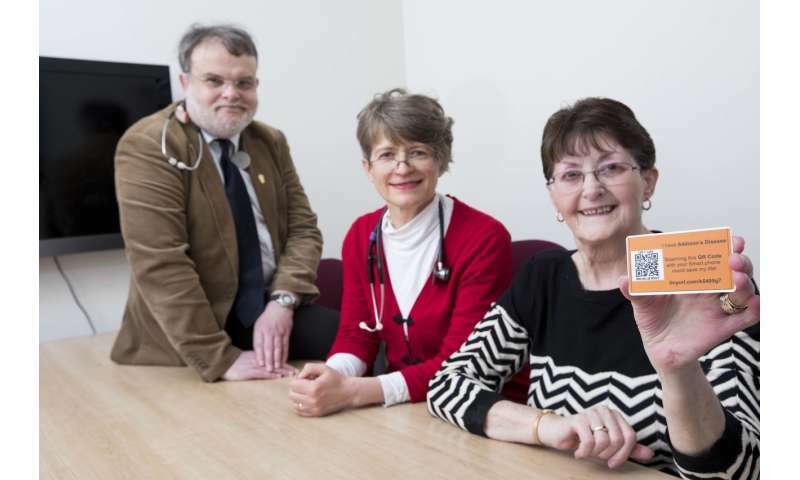 A team of experts have now developed a Quick Response (QR) code which may be carried by patients and scanned to access vital medical support. 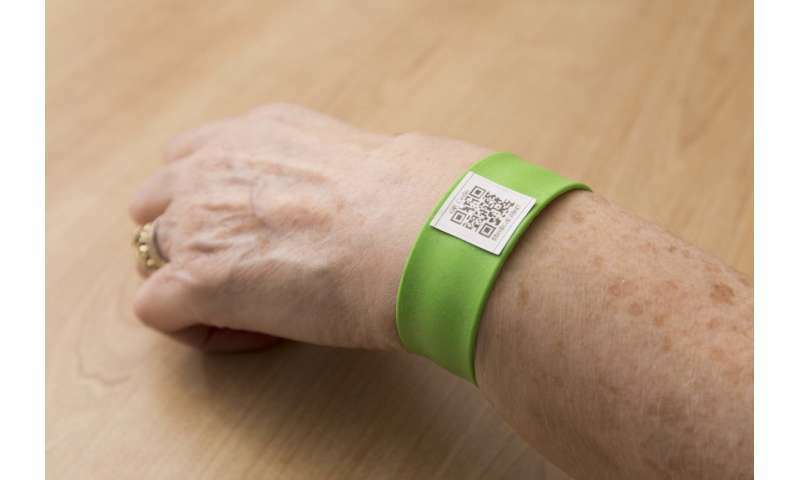 The QR code is printed on bracelets and plastic cards and, when scanned using a smartphone, links to the Addison's Disease Information System (ADIS), which provides comprehensive clinical management advice specific to the patient. Information displayed by the ADIS includes emergency treatment the patient may require, a letter from a medical consultant and advice about preparation for surgery. A study, published today in BMJ Innovations, shows that the use of QR codes allows patients in a serious condition to receive better emergency care by giving a healthcare professional immediate access to treatment protocols. Dr Jolanta Weaver, Senior Lecturer at the Institute of Cellular Medicine, Newcastle University, is lead author of the study that involves experts from the Queen Elizabeth Hospital in Gateshead. She said: "Rare medical conditions are prone to poor management in non-specialist units as, by definition, their presentation is uncommon. "Some healthcare professionals do not feel they have the appropriate knowledge or confidence to manage these cases and they may need more support from information systems such as ADIS. "Our ADIS uses a web app running on a smart device, linked to a QR code. It is accessible at all times and shareable with healthcare professionals, patients, their carers, or when required in an emergency by bystanders. "The system offers immediate access to clinical guidance, which we hope will prevent unnecessary deaths linked to Addison's disease." Experts became interested in improving the management of Addison's disease and developing the ADIS after hearing about the preventable deaths of a number of patients due to adrenal crisis. Hydrocortisone maintains health by helping control blood pressure and glucose levels and manage the body's response to stress. The disease is treated by daily tablets of a 'synthetic' cortisol. For the study, 54 healthcare professionals - doctors, nurses, paramedics and dentists - were asked for their experience in managing adrenal crisis and their professional views of the ADIS. Findings revealed that 37% of healthcare professionals have never seen and 59% have never managed an adrenal crisis. The survey showed that there is a clinical need to improve the acute management of adrenal crisis. Healthcare professionals expressed a preference for QR code-linked information and as many as 96% of those who took part in the study thought that the ADIS would be helpful in an acute setting. Dr Kilimangalan Narayanan, Consultant Physician and Head of Service Medicine, at the Queen Elizabeth Hospital in Gateshead, welcomed the use of the ADIS. He said: "Dr Weaver's work has highlighted an important area of patient safety relevant to patients who have cortisol deficiency. "Her team's work has formed the basis for subsequent further improvements in care by introducing a system of 'alerts' within the patient record on our hospital patient management system." QR codes are free and can easily be generated and printed using free web-based software. Although they have been used for labeling medicines, and patients, to prevent wrong site surgery, their use to access clinical management information is a new development. Dr Andrew Colman, a computer scientist, physician and research associate at Newcastle University, developed and implemented the ADIS. He said: "I was motivated to develop this computer system to improve the care of patients with Addison's disease when I heard Dr Weaver give a lecture to medical staff about the condition. "Dr Weaver explained that recently in the country two patients with Addison's disease had died unnecessarily due to poor clinical management and I wanted to find a way to help prevent this happening again. "Many healthcare professionals lack the experience and knowledge of treating such rare conditions and the ADIS enables them to access life-saving information in a critical situation." Pauline Copeland is the first to receive a QR-code bracelet linking to her Addison's Disease Information System. The grandmother-of-eight was diagnosed with the condition almost 40 years ago and has suffered critical situations where medics have not known what to do when she has had an adrenal crisis. The 67-year-old, of Pity Me, County Durham, said: "Addison's disease can be a life or death situation. If I become acutely ill I need to be treated straight away - not in a few hours or tomorrow, but immediately. "As my illness is rare, medical staff do not always know how best to treat me and this can be a worry as they need to understand the importance of my condition and how to treat an adrenal crisis. "The QR-code will give me confidence to know that professional healthcare staff, or anybody else using the ADIS, will be given access to medical information on adrenal crisis immediately so that I am given appropriate care."